Last Saturday was the holy grail of Saturdays’ – as it was completely and blissfully commitment and errand free. As you might have guessed by the high number of breakfast posts, my favourite way to ease into a lazy weekend is to read the papers (okay, the magazines and lift-outs that come with the papers) over breakfast, which has been made by someone other than me. 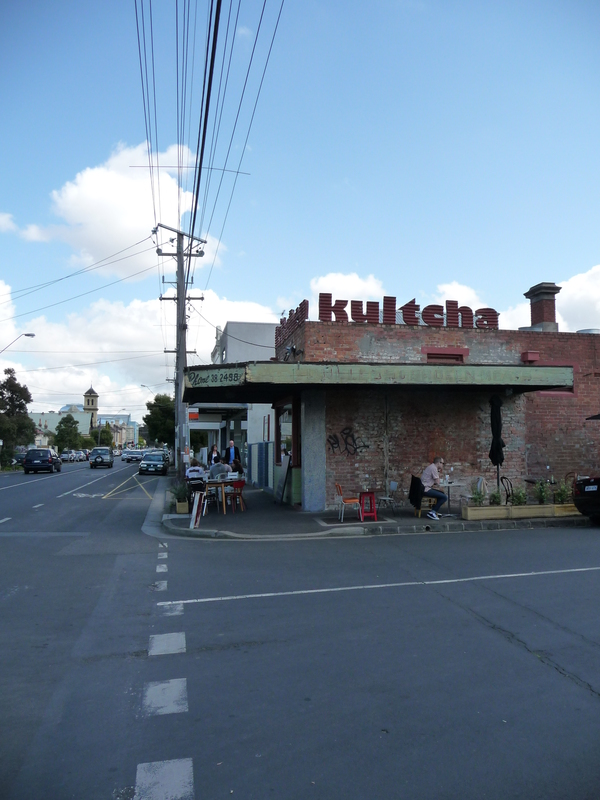 I used my free Saturday to try out Kitchen Kultcha, a new-ish cafe on Glenylon Road, Brunswick – just a few minutes walk from Sydney Road. Before housing Kitchen Kultcha this brick building has had many different lives. Most recently is was a fish and chip shop and before that it was a ye olde butcher (you can even still see the old and faded ‘Broken & Boneless Meat’ butcher sign out the front). As always I started with a strong flat white ($3.50). 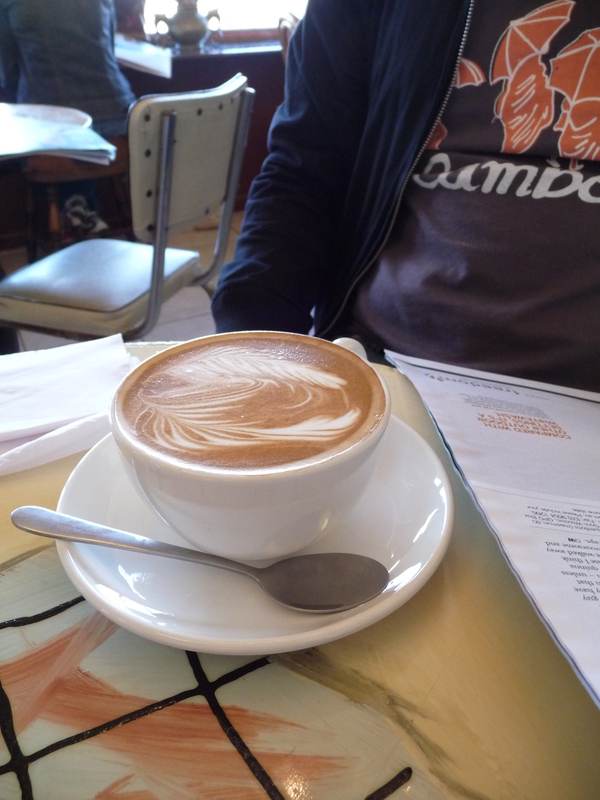 The Brooding Architect and I agreed that the coffee was exceptionally good – strong, creamy, no trace of foam. The Brooding Architect has worked from home for the past year – frequenting each and every coffee shop in Brunswick - so for coffee to get his seal of approval speaks volumes to me. 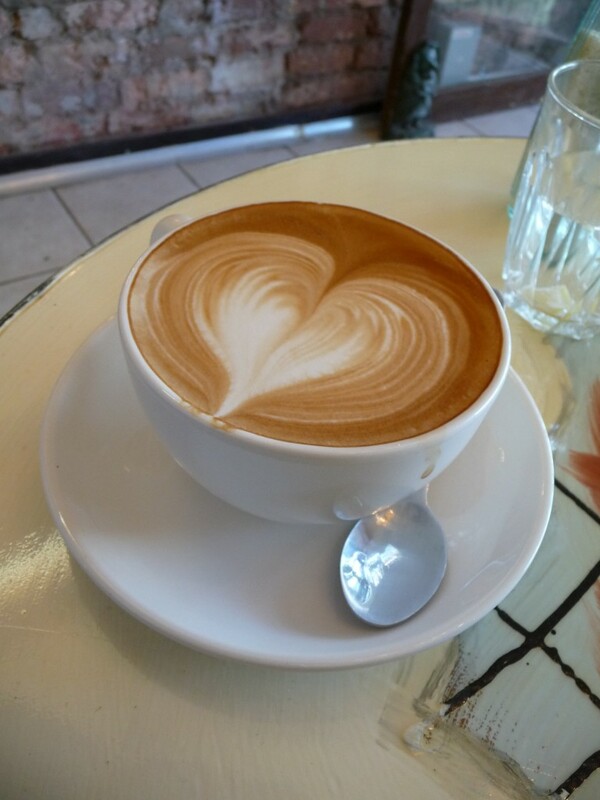 For some reason though, they did not give the Brooding Architect a heart on his flat white? While I drank my coffee I took a good look at the eclectic fit out. There were Chandeliers, Mediterranean style table tops, op shop paintings on the walls and a Buddhist statue at the entrance. Despite sounding chaotic the space works. The whole place has a very relaxed vibe – the staff are friendly, there are kids from the local kindy down the road running around and there are hipsters with hangovers. Somehow all of these elements just seem to harmoniously blend together. There is also free wifi, so all of you with your iPads (you know who I am talking about) can sit there reading your e-Newspapers (or playing Fruit Ninja) to your hearts content. 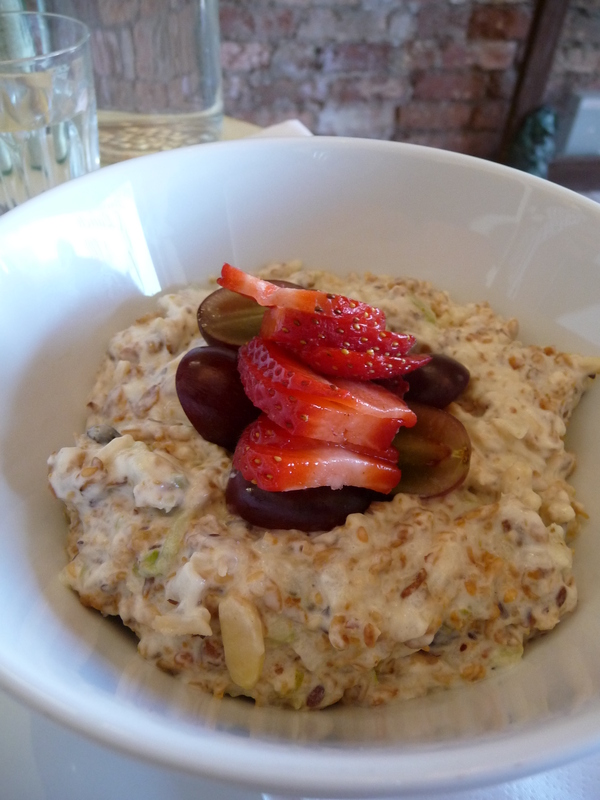 I generally think ordering muesli when you are out at a cafe is a classic ‘rookie’s mistake’; as it is one of those things that it so easy to make at home, plus who feels like being healthy on the weekend? However, the muesli options at Kitchen Kultcha are très fancy – plus my first choice of the Beef Cheek Pastie was already sold out. (As a Beef Cheek Lover I will have to come back for this pastie very soon though). I ordered the Granola ($8). This is clearly homemade, chock full of premium dried fruits and nuts – sliced almonds, roasted hazelnuts, pepitas, currants, cranberries, dried apricots and a sprinkling of orange rind. Not a sultana or the other dreaded filler fruit, dried paw paw, in sight. Lots of crunch and lovely cinnamon undertones. The Granola must be topped with full fat milk – this is completely non-negotiable. 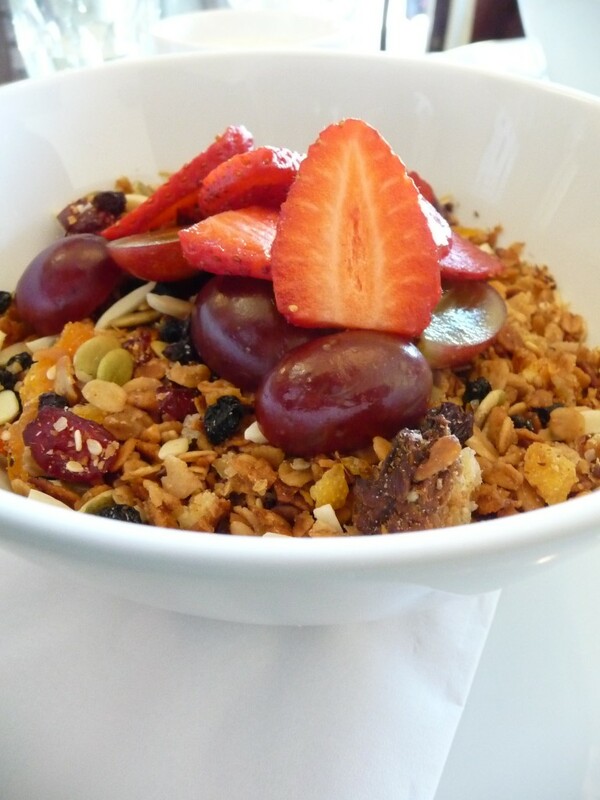 The Granola is meant to be topped with poached seasonal fruit. Unfortunately due to our lazy start to the day, the kitchen had already run out of poached fruit, so the Granola was topped with fresh strawberries and grapes instead. The fresh fruit was lovely and sweet, however I think some poached fruit – such as rhubarb, apple or pear – with a little acidity would have been the perfect match. Inspired by my healthy choice, the Brooding Architect jumped on the virtuous bandwagon and ordered the Bircher Muesli ($8). It was infused with rosewater and creamy natural youghurt (no low fat substitutes here). Just before serving fresh grated pear, rather than the usual grated green apple, is then added to the mix. It was healthy, delicious and deceptively filling. Thanks Hungry Lawyer! Just bought a Living Social deal for this cafe due to your positive review Looking forward to the coffee and Bircher muesli. Jenny: Thanks for the feedback – hope you enjoy breakfast at Kitchen Kultcha. I also suggest the braised pork and apple pastie, if you are feel like something more decadent than muesli!